Hanh Do has a decade of experience in marketing and business administration at various Vietnamese companies. 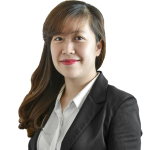 Before joining BGA, Hanh worked as marketing communication manager at Nhat Nguyet Import-Export Company, one of the leading import/export companies in the garment and textile industry, between 2012 and 2015. She developed and managed the execution of the company’s marketing programs, including media campaigns, events, marketing materials and digital marketing activities. Hanh was also experienced in marketing and business administration at the Vietnam International Bank and Vinaphone between 2003 and 2012 at various executive positions. Hanh graduated from the University of Westminster with a master’s degree in marketing communications. She also earned a bachelor’s degree in planning and economics from the Vietnam National University of Economics.